The Division 2 will take you to post-apocalypse Washington, D.C. on March 15, and The Division 2 beta is open to all from March 1 - 4. But if you definitely plan to play this shared-world shooter at launch, Ubisoft has a little reward for those who pre-order The Division 2 on PC: your choice of a free game from three worthwhile options. Once you've made your purchase on PC, simply hop over to Ubisoft's offer page and sync up your Uplay account with the activation key sent by your retailer of choice. Remember that Steam isn't an option here after the Epic Games Store snatched The Division 2 away from Valve's storefront. From there, the only question is: which of these three games should you get at no charge? If you're looking for the next best thing to The Division 2's third-person firefights, Ghost Recon Wildlands is the perfect pick to tide you over, with its open-world, open-ended combat that charges you with taking down a drug cartel by any means necessary. It's also got 4-player co-op, so you can start bonding early with any squadmates you plan to reunite with in Washington's war-torn streets. Watch Dogs 2 is a worthwhile choice if you're keen on taking a virtual trip to San Francisco, taking corrupt corporations down with hacktivism and 3D-printed firearms. It's a great jumping-on point for the series as you can safely skip the mediocre original, and with Watch Dog 3 rumors swirling, now's a great time to practice your open-world hacking skills. Last and possibly least of your options is Far Cry Primal. It's a bit of a black sheep for the FPS series, as it takes you back to 10,000 BCE, way, way before guns were invented - but if you're keen on killing cavemen with spears and tamed animal companions, it'll definitely keep you occupied. It may not have the anarchic, post-apocalypse punch of Far Cry New Dawn, but maybe you're in the mood to wreak some havoc in the Mesolithic era instead. Ubisoft's offer page has a handy timer in the top-left corner, so you know just how long you've got to make use of this generous offer. At the time of this writing, there are still 44 days left on the deal, so you've got plenty of time to mull over your free game of choice, or decide whether or not you plan on pre-ordering The Division 2 to being with. 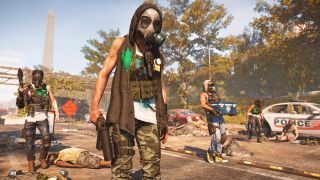 After some hands-on time, we determined that playing The Division 2 campaign and endgame feels like it could fill a Destiny shaped hole in our lives. Razer Turret gaming keyboard and mouse for Xbox One review: "High end PC peripherals custom built for a console"